Dr. Tim Garrett will present “Global Metabolomics: From a Chemistry Tool to Clinical Diagnostics,” on Wednesday, November 18, 2015, from 4:00-5:00pm, in Leigh Hall, Room 207. Time: 4:00 p.m. – 5:00 p.m.
Timothy J. Garrett earned his Bachelor’s in Chemistry from the University of Georgia (Athens, GA) in 1999. After working in industry for a couple of years, he returned to school for graduate study at the University of Florida (Gainesville, FL) where he earned a Doctor of Philosophy in 2006. 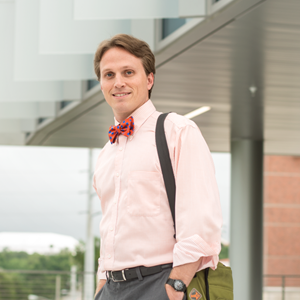 Dr. Garrett then transitioned to an assistant professor position in the College of Medicine at the University of Florida, and assumed operation of the Biomedical Mass Spectrometry facility. He has focused his work on expanding the use of MS in clinical sciences through education, analysis, and collaboration. At present, Dr. Garrett has collaborated with over 30 faculty members at the University of Florida. Dr. Garrett is currently a Research Assistant Professor in the Department of Pathology, Immunology and Laboratory Medicine at the University of Florida. He is Director of the high-throughput MS metabolomics core of the Southeast Center for Integrated Metabolomics (SECIM). Dr. Garrett is also working closely with the University of Florida Clinical and Translational Science Institute as well as UF Clinical Toxicology to grow and expand MS services for diagnostics. For more information, visit Dr. Garrett’s laboratory website. Please distribute the announcement to any interested parties.